The past week, I've been thinking about food and farms a lot. I saw "Food, Inc." on Saturday evening, and it's definitely one of those films that has you asking more questions than it answers for you. For those of you who haven't heard about it, it's essentially about the industrialization of our food supply chain and the detrimental effects this has on food safety, food nutrition, farmers' livelihoods, and the humane treatment of animals and humans alike. That's a lot to cover in 90 or so minutes, and the subtleties and complexities are somewhat lost. However, one thing is not lost: that we can do better...perhaps by going backwards? The film features as its "good farm" Polyface Farms in the Shenandoah Valley of Virginia. They aren't a vegetarian farm refuge; they kill things to eat. But, they farm the way your grandfather may have farmed, or, how my great grandfather may have farmed. Actually, I have no idea if my great grandfather farmed like that, but there was no doubt he had a small farm. The above picture is from my dad's mom's family's farm in Western PA a few years ago right before it was sold after my great aunt's death. 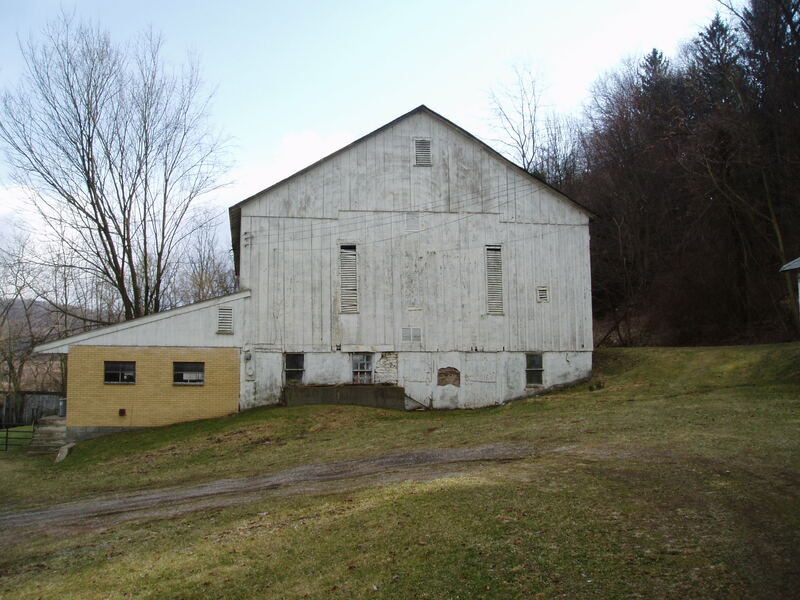 It had pretty much decayed, as many small farms have. It was kind of sad to see, knowing that my great grandfather built it after coming to this country with only about 50 cents and working in a coal mine to save money to buy it. When I was little, they still had dairy cows, which to a kid, is like the most fun thing you can have around. And, that milk was the best milk ever. As it turns out, I can get milk in glass bottles from the corner store near me. It isn't unhomogenized, but it is pretty close--something about the glass and the cows being out in the open. The store (P&C Market) also carries beef from Polyface Farms. I'll let you know how it is. I'm now trying to "buy local" on much of my food. Both because of the "corporate farm machine" atrocities, but also for a much simpler reason: the food is so much damn better! I had some blueberries last week that actually tasted like blueberries! And a cucumber that was intense in its cucumberness. It was an amazing difference from the ones I got in the supermarket. This got me to thinking: if my food tasted better--like HD Food instead of normal food--might I not be satisfied on less? (Doubtful, but a girl can dream.) It kind of grosses me out thinking of the faux food we've all gotten accustomed to eating, and I'm not talking blueberries...but all that packaged junk. Do we really pay attention to how it tastes? 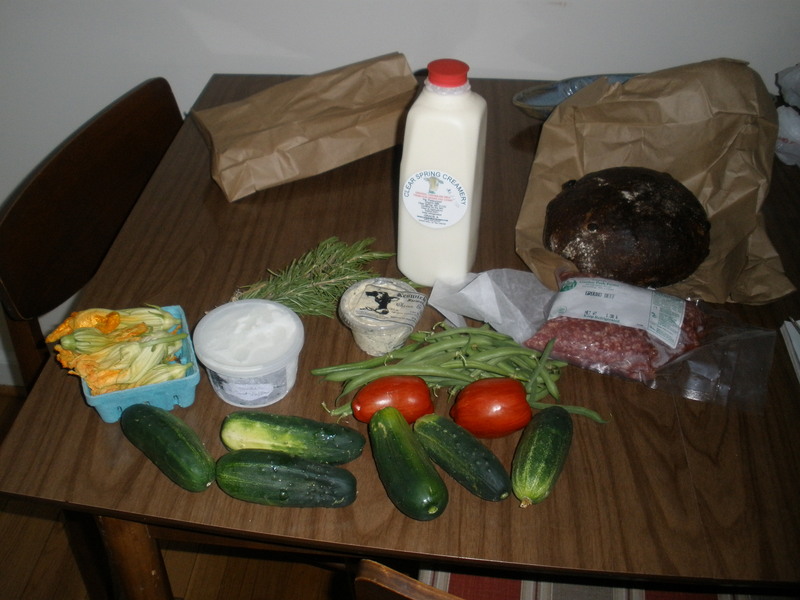 I got squash blossoms ($3), raisin pumpernickel bread ($5), cucumbers, green beans (about a quarter of what I got is shown) and heirloom tomatoes ($6? ), a little over a pound of ground beef from a nice Amish man ($7.50), a quart of creamline milk and some Boursin-like chive and dill cheese ($7.50), cucumber mint vodka sorbet ($6), and a bunch of rosemary (didn't need it but it was being sold by a bunch of kids for $1). I also experienced the disappointments--by the time I got there (a little before they close at noon), most of the bread was gone, as were the eggs. If they had blueberries or strawberries or raspberries, there were none left. I also experienced the problem I often have at farmers markets: distraction from a list. Boursin? Sometimes, these diversions create nice surprises, like the squash blossoms. I saw a recipe in my San Francisco Ferry Terminal Farmer's Market Cookbook and thought I'd never get to try it! I'm going to stuff them with herbed ricotta and fry in olive oil. Anyway, since I didn't get everything I wanted, I'm going to go to Eastern Market tomorrow to finish my list off--mostly fruit. Not as doubtful as all that -- I've experienced the phenomenon of eating more (or eating fattier, saltier, sweeter food) to make up for lack of taste with real dimensions. Although I haven't jumped on the locavore train yet (which has to do with what does and doesn't grow in Arizona -- I ate much more locally when I lived in California), I firmly believe in eating only real food. No artificial sugars, no artificial fats, and (as far as possible) no high-fructose corn syrup. While my genes are on my side for thinness, these habits do seem to make a difference within my normal weight range. If you haven't read it yet, you will love "Animal Vegetable Miracle" by Barbara Kingsolver....it's all about how our food supply has changed, why, the politics involved (I had no idea!) and most importantly, how her family dedicated a year of their life to eating locally.